This is a most basic introduction to reading charts. Examples for both Reading Charts for Knitting in the Round and Reading Charts for Knitting Flat are included. The old “a picture’s worth a thousand words”. Written Directions: Slip next 3 sts to cable needle and hold to front of work, k2, slip left-most st from cable needle to left needle, p1, k2 from cable needleora symbol representing all those words. #2 for knitting flat (like a scarf or blanket). ‘what you see is what you get’ since the chart always represents the Right Side of the work and, when knitting in the round, the Right Side of the work is always facing you. because they take a little mental gymnastics – you have to be able to visualize working from the Wrong Side of the work, creating a stitch that will give the desired result on the Right Side, and work Wrong Side rows from left to right. How do I know if it’s a chart for Knitting in the Round or Flat Knitting ? Look at the row numbers along the side of the chart. #1: If all of the row numbers are sequentially along one side (usually the right side) then it is a chart for knitting in the round*. #2: If the row numbers alternate between being on the right side and on the left side, then the chart if for flat knitting. * There’s always a but, isn’t there? 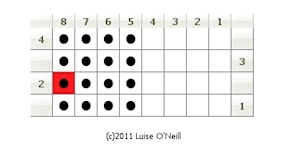 Many lace charts leave out the Wrong Side rows (when each WS row is worked the same e.g. purl) and therefore only show numbers along the right hand side of the chart. However, the row numbers will be 1, 3, 5, etc. so you know that rows have been hidden. See the Lace Charts section below. Let’s use one of the above charts as an example. How charts are read depends on whether it is worked “flat” or “in the round” so this is the first thing that needs to be identified. What are those 8 stitches in each row? How am I to actually work them?The answer is in the Legend or Key that accompanies the chart. This is the legend that accompanies the chart above. It tells us that a blank square is a Knit stitch. OK, you say, that’s not a very exciting chart — true — so let’s look at a chart with a tiny bit more variety. How Do I Translate that into Knitting? Charts represent the public face or Right Side of your work – they show you what the Right Side will look like. Charts for knitting in the round are read (and worked), beginning at Row 1 from Right to Left <—————-. I work Stitch 1, Stitch 2, etc. all the way to Stitch 8. Every Row is read from Right to Left <—————- until you’ve finished working the last row of the chart. So, we begin at Row 1, Stitch 1 i.e. the bottom right-hand corner of the chart. The first 4 stitches are blank squares so I would knit 4 stitches. The next 4 stitches are black dots so I would purl the next 4 stitches. The first 4 stitches are black dots so I would purl 4 stitches. The next 4 stitches are blank squares so I would knit the next 4 stitches. Now, since we are working this in the round, and unless we have gigantic yarn, 8 stitches will not make a circle of anything, so we need to repeat this pattern if it’s to be at all practical. The beauty of charts is shown again here because we don’t need to do anything else to the chart. All we need to know is how many times to repeat the chart stitch sequence. This information is usually given in the written pattern directions. For an adult hat worked in worsted-weight yarn [about 5 sts to 1″ / 2.5 cm], casting on 96 sts would create about a 19 1/4″ / 49 cm circumference hat. Each row of our 8-stitch chart would have to be repeated 12 times to reach the end of round. Then R2 would be started and worked for 12 repeats and so on. Now comes the harder part. Because charts always show the Right Side, in order to read a chart for knitting flat, you have to be able to visualize how to work a stitch on the Wrong Side so that it creates what you want on the Right Side (RS) i.e. what the chart is showing you. First, I have to tell you that stitches are two-faced! Yes, yes, yes! When you knit a stitch and look at the back side of that stitch it’s not a knit at all but a purl!!!!! Yes, every time you create a knit stitch (the swatch on the left shows lots of them), and you take a peek at the Wrong Side (the side not facing you) of the work — what do you see? — why a purl stitch (swatch on the right)! 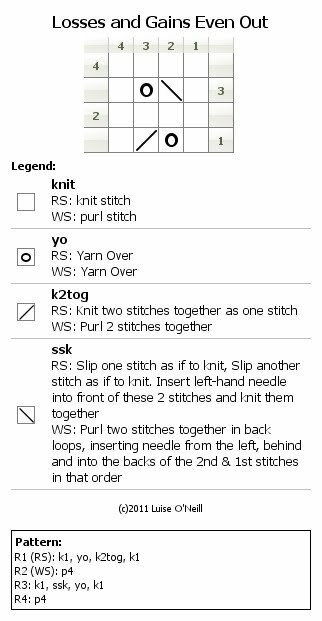 ~The Legend shows both RS and WS definitions for the stitches. The first row number is at the right side of the chart, indicating it is a RS row *. 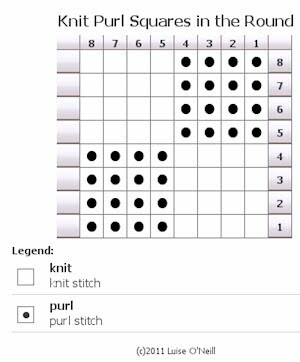 Read R1 from right to left <———–, so (if you did your homework up above you’ll know that the 4 blank squares represent 4 knit stitches and the 4 black dots represent 4 purl stitches), K4, p4 and turn your work to begin R2. 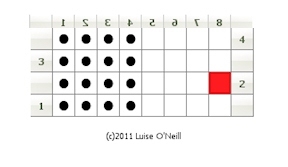 Notice the directional arrows in the chart below – they show the direction that you work each row. #1: The chart shows you the RS of the work but YOU DO NOT HAVE THE RIGHT SIDE OF THE WORK FACING YOU (it’s like you’re hiding behind the chart – you could play peek-a-boo!). #2: Those rows are worked from Stitch 8 to Stitch 1 i.e. in reverse order. Here’s a quick visual – the first chart on the left (<——-) shows only the first 4 rows of the above chart (to save space). Stitch #8 is highlighted in red to keep tabs on it. The second chart on the right (—->) shows what it looks like when you’ve turned your work so the WS is facing you. Notice Stitch #8 in the second chart is at the right edge of the work and becomes the first stitch to be worked. (That second chart shows what you have to visualize for each even-numbered row. So, beginning at Stitch 8, you have to figure out how to make the stitch you are creating appear as it should on the RS. How Do I Work Those WS Rows? 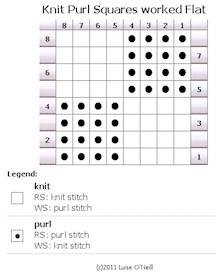 For R2, Stitch 8 appears on the chart as a black dot meaning it is a Purl stitch on the RS of the work. We know from our swatch experiment above that the back of a purl stitch is a knit stitch. Our Legend in the chart above also tells us that, when working a WS, a black dot is a Knit. So, to work R2, I will Knit Stitch 8, Stitch 7, Stitch 6 and Stitch 5 and I will Purl Stitches 4 – 1, and turn. R3 (RS): K4, p4, turn. R4 (WS): K4, p4, turn. R5 (RS): p4, k4, turn. R6 (WS): p4, k4, turn. R7 (RS): p4, k4, turn. R8 (WS): p4, k4, turn. These are just some simple examples to get you started. Hope they’re helpful. Here’s a sample of a lace chart. Notice that only odd-numbered rows are shown. The row numbers appear along the right-hand edge, so these are all RS rows, i.e. all chart rows are read from right to left <————–. All of the even-numbered rows (Wrong Side rows) are hidden. Why? Every chart symbol represents an action. This action may involve only 1 stitch or 2 or more stitches. Charts may show knitting where A) the stitch count remains constant (no gains of losses of stitches overall) or B) where the stitch count changes. R1: K1, p1, k1, p1. The following chart shows examples of chart symbols (actions) involving more than 1 stitch. An even number of stitches in a chart can also be maintained by balancing decreases and increases i.e. for every stitch that is decreased in a row, a new stitch is created. These pairings can happen side by side or apart from each other with very different effects. We’ll look at the first example: side-by-side increases and decreases. The K2tog Chart below shows another example where an action takes more than 1 stitch. It also shows an example of reducing the number of stitches being worked. The 2 green stitches identify the 2 stitches that will be knit together in the next row. R3 only contains 3 stitches. 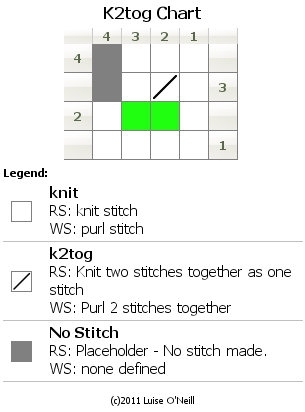 In R3, we: k1, k2tog (an action which takes 2 stitches – the green ones – and makes them into 1 stitch), k1. Note that the k2tog symbol only takes up 1 square in the chart since the action results in a single stitch on the needle. Since our decrease gives us only 3 stitches in this row now, the last stitch has been turned into a “no stitch” (gray square). A ‘No Stitch’ symbol means “ignore me, I’m not really here – just carry on…”. A ‘no stitch’ can be placed at the end of the row or within the row; it depends on the chart and designer’s preference. Sometimes ‘no stitch’ symbols are placed within a chart to keep other chart elements lined up.